Mark Westman on Mt. Foraker’s Infinite Spur. Alaska has hundred of amazing route and peaks. Below are some of the best in the Central Alaska Range. 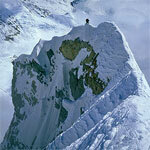 Learn general info on Alaska Climbing  where to stay, how to get there, maps, etc..